It was a union of sorts between federal, state and industry initiatives, culminating in a day that will be remembered in the history of solar power. At the factory of SunPower (s SPWRA) and Flextronics in Milpitas, Calif., Department of Energy Chief Steven Chu unveiled a large $1.2 billion loan guarantee for a solar farm from NRG Energy that will be built in San Luis Obispo County, Calif. At the same time, California Governor Jerry Brown signed into law a bill that says California utilities need to source 33 percent of their electricity from clean power by 2020. 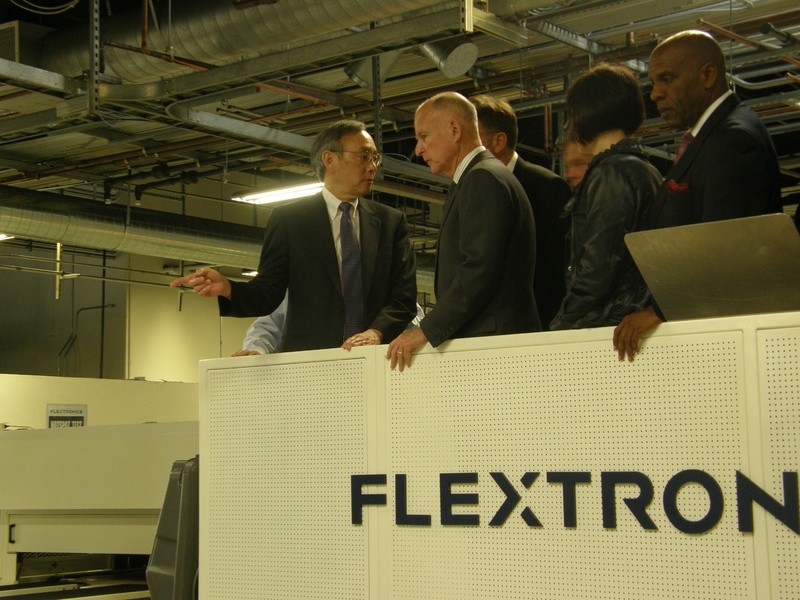 To top it off, the event was also the official opening of the SunPower and Flextronics factory, which will create 100 jobs in the area and build enough solar panels to power 25,000 homes each year. SunPower CEO Tom Werner had an accident on his bike last week. I think they said he actually broke his neck :(. He said it took a lot for him to be there at the event. A lot of people at his company didn’t expect him to make it in person. The man is dedicated. That’s SunPower CEO Tom Werner. what happened to dan shugar? i.e., the neck brace? Good for SunPower. We are working with them on an energy storage grant from the California Energy Commission to integrate the VRB flow battery with a rooftop PV installation. The huge installation in San Luis Obispo will need megawatt storage to control the major fluctuations of power from passing clouds and ramping from morning sun.